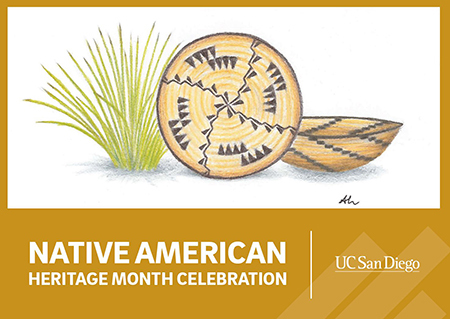 Find out about events connected to the Native American Heritage Month Celebration (formally California Native American Day Celebration - CANA-Day). Time: 7:00 p.m. - 10:00 p.m. Doors Open: 6:00 p.m. Description: In preparation for the Native American Heritage Month Luncheon and Keynote Speaker Eugene Brave Rock, the NAHM Committee in partnership with University Centers will be hosting a screening of Warner Bros. 2017 “Wonder Woman” featuring Native American actor, Eugene Brave Rock. You’re invited to stay for a special presentation and Q&A with Mr. Brave Rock after the screening! Movie plot: Diana, princess of the Amazons, trained to be an unconquerable warrior. Raised on a sheltered island paradise, when a pilot crashes on their shores and tells of a massive conflict raging in the outside world, Diana leaves her home, convinced she can stop the threat. She embarks on a journey to end the war of all wars - whilst discovering her full powers and her true destiny. Description: This luncheon serves as a kickoff to a month-long schedule of activities honoring our Native American scholars that recognize their academic achievements to support equity, diversity and inclusion at UC San Diego. This year’s keynote is Eugene Brave Rock, Actor, Stunt performer. Brave Rock is a Blackfoot from the Blood Tribe in southern Alberta, Canada and is best known for his acting role of "The Chief" in Wonder Woman (2017). Brave Rock has performed in "Buffalo Bill's Wild West Show (Euro Disney), which led to other opportunities in film and television including setting up boot camp for Native American Stunt performers featured in the Oscar award winning film "The Revenant". Description: Celebrate Native American Heritage Month at the Native American Appreciation Night at the UC San Diego Men’s Basketball Game. Join us before the game for the Native American Community Reception. Refreshments will be provided. RSVP required. Description: The Smudging is a contemporary Native horror film. Native Director/Filmmaker, Mike Marin, will join us to speak about his film. Description: Rez Beats is community project initiated by the Indian Health Council to provide a safe space for youth as an open mic to share their feelings, thoughts, and experiences. Time: 8:00 p.m. – 9:30 p.m. Description: The Native American Heritage Month Committee is inviting, Lakota, Dakota, and Hidatsa guest speaker Tonia Jo Hall to share her experiences as a contemporary Native artist, speaking about Native issues and content. She is also a motivational speaker who travels across the country to share positivity to her fellow Native communities. Description: The Powwow is a Native American gathering focused on dance, song and family celebration. It celebrates the connections to tradition and spirituality, to the Earth and to one another in a social, personal and spiritual meeting. Office of the Chancellor, Office of the Vice Chancellor for Equity, Diversity, and Inclusion, Office of the Vice Chancellor for Student Affairs, Office of the Vice Chancellor for Resource Management and Planning, and Welcome Week 2018. For more information, please contact NAHM@ucsd.edu.